Before setting sail on the Douro River, experience three legendary Spanish cities: Salamanca, the lovely "Golden City"; Madrid, renowned for its museums, stately royal palace and vibrant nightlife; and Toledo, the city of El Greco and a magnificent tribute to the three great cultures that forged Spain. Cruise through the UNESCO-designated Douro Valley, where grapes have been grown for 2,000 years, visiting picturesque quintas and meeting the winemakers who operate them, as well as tasting the wine. Get even closer to natural treasures at the Douro International Natural Park, where you can get a better understanding of the flora and fauna of the land with an intimate boat cruise, and at the Quinta Aveleda's gardens, offering an enchanting landscape that boasts a cascading waterfall, graceful swans swimming, peacocks flaunting their colours and so much more. Visit the walled village of Castelo Rodrigo, a site that dates back to the 12th century, and the pilgrimage town of Lamego to see the monumental baroque Sanctuary of Nossa Senhora dos Remédios. Travel through the verdant countryside to Óbidos, a charming hilltop town that has entranced visitors since the 13th century en route to Portugal's colourful capital of Lisbon. FEATURED EXCURSIONS: "Madrid at Your Doorstep" vicinity walk. Arrive at Madrid–Barajas Airport, where you will be transferred to your hotel. Join a guided walk to begin getting acquainted with the city. FEATURED EXCURSIONS: Choice of Madrid city tour with Prado Museum OR exclusive guided "Go Active" walking tour with Prado Museum visit, and dinner with flamenco show. Choose one of two ways to explore Madrid—both giving you a sense of Madrid's layout and architectural highlights. Join the panoramic tour of this metropolis, showcasing Madrid's top sights, or take in some of the key sites on a guided active walk through the historic city. Both tours are followed by an excursion to the massive Prado Museum and its acclaimed collection of European art. In the evening, enjoy dinner and a flamenco show at one of the city's finest venues. FEATURED EXCURSIONS: Toledo city tour. Known as the "City of Three Cultures," Toledo, a UNESCO World Heritage Site, has been heavily influenced by Judaism, Christianity and Islam, all of which have peacefully co-existed here for centuries. FEATURED EXCURSIONS: Full day Salamanca tour. Travel from Madrid to Salamanca, where you'll be guided through this UNESCO-designated city known as the "Golden City" for the distinctive patina of its centuries-old sandstone buildings. You'll have a chance to visit Salamanca's food hall as well as sample many of the city's delights. You'll then journey to the Spanish border town of Vega de Terrón to embark your ship. FEATURED EXCURSIONS: Choice of Castelo Rodrigo OR half day scenic cruise at the Douro International Natural Park. Travel through wonderfully scenic countryside to Castelo Rodrigo. Take a guided tour of the walled village of Castelo Rodrigo, and while here, sample delicious local treats, such as honey and olive oil. If you prefer a different type of experience to better understand the flora and fauna of the land, you'll want to go on a half-day scenic cruise at the Douro International Natural Park. FEATURED EXCURSIONS: Choice of Quinta do Seixo guided tour and tasting OR famous Pinhão wine estate and visit to family-owned quinta, and Douro Museum. Journey to Quinta do Seixo—a prestigious Port wine estate—for a tour of its state-of-the-art facility, and sample some of their famous Port. Others may prefer to enjoy a scenic drive through Pinhão before visiting a famous wine estate and family-owned quinta. Afterwards, learn about the region's winemaking history during a special lecture at the Douro Museum. FEATURED EXCURSIONS: Lamego walking tour with wine tasting at a local quinta. Stroll through this pilgrimage town of Lamego to the monumental baroque Sanctuary of Nossa Senhora dos Remédios. Later, enjoy a wine tasting at a lovely local quinta. FEATURED EXCURSIONS: Choice of Quinta Aveleda visit and gardens OR Amarante walking tour. Wander through the Quinta Aveleda's gardens, where you'll find a thatched house for geese, peacocks flaunting their colours and graceful swans. If you prefer, stroll through Amarante and discover the unique heritage bequeathed by the town's patron saint, ranging from a beautiful Dominican monastery to delicious sweets. FEATURED EXCURSIONS: Choice of Guimarães city tour OR "Soul of Porto" Ribeira district walking tour. It's only fitting to end your "Paris & Impressions of the Seine" cruise with two artistically and culturally rich experiences. Visit the Orsay Museum, where you'll see some of the most famous impressionist and postimpressionist masterpieces from Monet, Van Gogh, Cézanne and countless others. You'll then venture to Montmartre, a designated historic area that was home to Pissarro, Degas, Renoir and Picasso, to name just a few, during the 1800s. Its enchanting character and village-like charm are on full display as you wander through the streets to Sacré-Coeur Basilica and to Place du Tertre. FEATURED EXCURSIONS: Choice of Porto city tour OR exclusive "Do as the Locals Do" Porto walking tour. Get a feel for vibrant Porto on a panoramic tour showcasing the UNESCO-designated 19th-century Stock Exchange Palace. For those wanting a more active exploration, climb 249 steps to the top of Clérigos Tower for the best view in Porto. 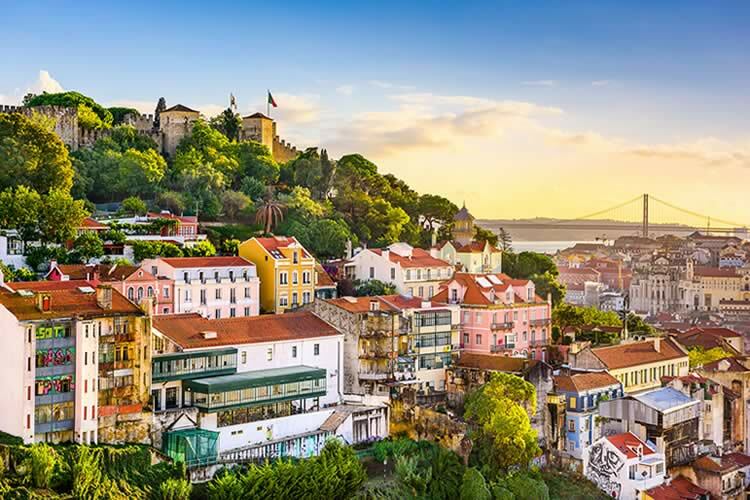 FEATURED EXCURSIONS: Guided stroll through Óbidos and family-style lunch As you head south to Lisbon, you'll stop in Óbidos, a hill town that has entranced visitors since the 13th century. It's so charming that the kings of Portugal traditionally gave it to their queens as a wedding present. From Óbidos, head to a local restaurant for a traditional Portuguese lunch before arriving in Lisbon. FEATURED EXCURSIONS: Choice of Lisbon city tour OR exclusive "Do as the Locals Do" Lisbon walking tour. You'll have a choice as to how you wish to explore Lisbon—via a guided tour or doing as the locals do. Your guided tour takes you to the Belém Tower, the Manueline Jerónimos Monastery, the Alfama district and Rossio Plaza. You'll even get to sample a traditional delicacy—pastéis de Belém—at a famous pastry shop. For a taste of local life, hop on one of the traditional yellow trams that toil up and down the steep streets. Visit the ancient castle of St. George, and take a fun spin through historic neighborhoods in a tuk tuk. Transfer to Lisbon Portela Airport for your flight home.